If you are among those, who have no idea about torrent seedbox, then you are going to learn in this article, in detail, about seedbox, how it works and how to upload and download torrents with ultra high speed with complete anonymity. The seedbox, we are going to review to explain in this article, is called, DediSeedBox – which makes the experience with downloading torrents a lot easier over secure channels with high speed. It is an all-in-one package for those who not only download high memory files from torrents but also upload them as well. We will get you through a thorough review of what this geeky little program offers and how you can benefit more from it. For those who don’t know even a bit about it, let me recap it for you so that you get familiar with it. SeedBox actually is a server which works remotely, providing an ultra-high downloading and uploading speed. Not only this, this server also features a Public IP address to protect the privacy of users. In short, the user will be provided a share of a computer which has a super-fast downloading and uploading speed, dedicated solely for the purpose of Torrents. DediSeedBox.com is one of the best SeedBox available out there, which provides a number of features worth using and is truly unlimited. All you have to pay is a minor monthly subscription fee depending on the amount of space and internet speed you select. If you can pay some dollars for the internet, spending few more to make it a super internet will not be a problem, though. Here are the benefits that you will get by subscribing to the DediSeedBox. Setting up the DediSeedBox is quite fast than any other SeedBoxes. It will hardly take 10 minutes after subscription that your request will be processed and you will be emailed your login details. The GUI provided with DediSeedBox is super-fast as well. We didn’t notice any lag in its performance. Everything was working very smoothly. Apart from it, DediSeedBox comes preinstalled with all major features with room for another one. Features include an unpacking tool along with HTTP download. We also didn’t notice any crash during a long period of usage. One of the best features of DediSeedBox is OpenVPN. It allows you to browse the internet with complete anonymity. Instead of your IP address, it makes you use its own one which is a public IP address. It encrypts your traffic to secure your privacy. Note that it doesn’t come preinstalled on DediSeedBox, but can be installed easily on all popular OSes including Windows and Mac. With it, you get a very fast and stable internet protocol which is less likely to drop the connection. Fortunately, there aren’t any vulnerability found in this feature yet. BitTorrent or Btsync as it is named by DediSeedBox is another cool feature which allows you a true peer-to-peer sync option. You may call it a file transfer app, but it has some different attributes. It allows you to transfer multiple files at a time, instead of one by one sequentially. Another cool aspect of this cool feature is that it uses egalitarian approach, i.e. anyone with the master key can access the files, unlike other tools which offer access to a particular user with the login password. This allows you to share your folder full of music and media with your friends or anyone else. With DediSeedBox, you will be able to stream your videos in DivX, MP4, MOV, AVI and MKV directly in your web browser, without any need to download it in your system. It is a browser plugin which is required to be installed first. 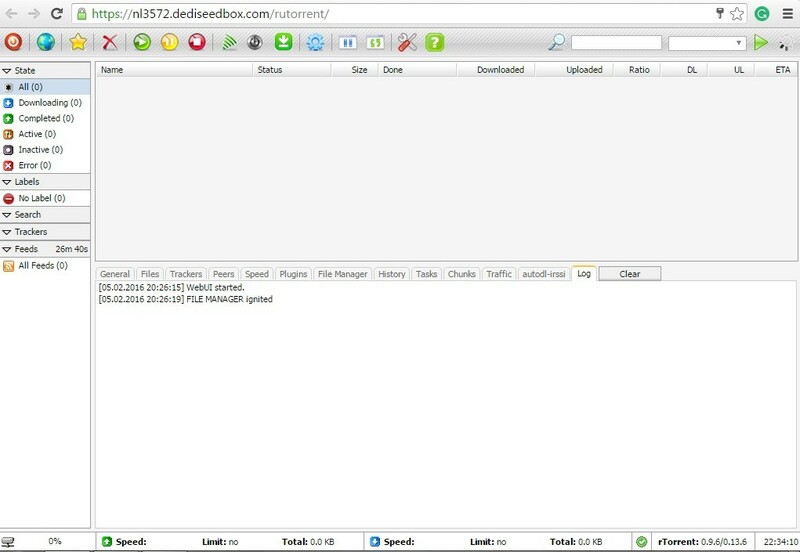 Once installed, you can stream your videos from DediSeedBox, in DediSeedBox. There isn’t any doubt about features of DediSeedBox. It is a true SeedBox, just as it mean. High speed downloading and uploading, safe, secure, reliable and cheap as well. With a number of plugins available, you can get the best of it.